Hebburn Housing. Medium Density Housing. Uni Project. 2009. This scheme was for housing on a rural/suburban greenfield site along a main road. Hebburn is historically a mining town with many small miner's cottages remaining in the area. 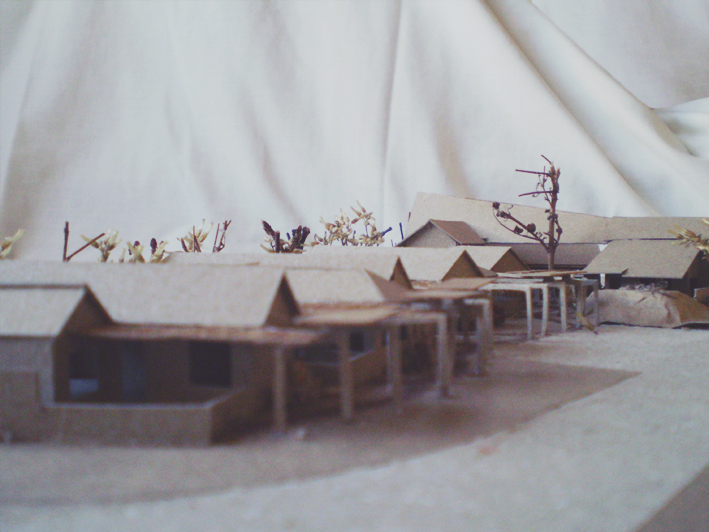 For this project, I looked at privacy, threshold and community. The development has a communal landscaped garden area, hidden from the street for residents to share. It leads on to the communal laundry. Residents park on the periphery of the site and make their way along covered paths to their home. Small front gardens encourage neighbourly activity and uphold the historical layout. The living areas of each house open onto a private north facing backyard, with landscaped berms to reduce noise from the main road. There are a range of 1 and 2 bedroom plans.